When you start out your career in writing, you bring along many notions. Unfortunately, they are not always correct or helpful. You must know the basic dos and don’ts of writing whether you are a reporter, a blogger or a social media marketer. A good always writer pays attention to the details that can improve the readability of his or her work. Be short and crisp on social media. The tip is to use easy to understand language, keep the message straight forward and keep the tone direct and interactive. If you are setting up your own blog, define a tone for your blog. Keep the blog clean of unnecessary messages and produce authentic, original and interesting content. Read here about how you can set up your own blog. 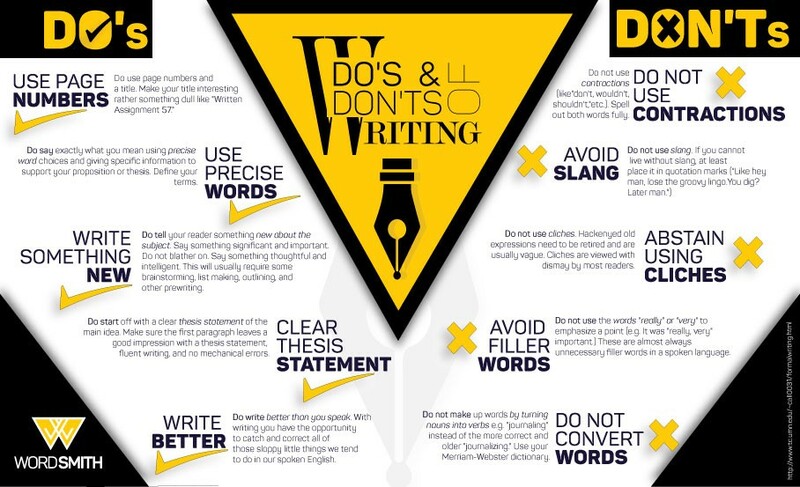 If you are writing for any other media, these dos and don’ts of writing in the infographic below might be helpful. It is important to devise a main key message for any piece of content. Once you have that, make the selection of USPs that you would like to associate to the key message. Use precise words and keep your sentences simple and short. Don’t confuse the reader with long and vague rants. To produce good content, it is important to feast on good and inspirational writings, auto-biographies, books and literature. When your brain absorbs good literature, you are bound to write better. If you would like to write better, you must read extensively and on varied topics. Take inspiration from the writers you enjoy reading. It is a good idea to discard the first draft. As a general idea, the first drafts are usually not worth publishing. If you have doubts, consult a writer or editor colleague who might be able to help you improve your copy. It’s always good to be open to feedback and seek it out actively. Take a look at some of the basic dos and don’ts of writing here, This might help you beat the writer’s block and inspire a new writing streak. Sadaf Malik is a blogger, graphic designer, photographer and a videographer. A creative spirit, she loves a good read especially if it is fiction. As a student at National University of Science and Technology (NUST), Sadaf has been a regular contributor for the university newspaper - Pakistan Ink. In her spare time, she loves to photograph landscapes and wildlife. An explorer at heart, Sadaf is always up for a new challenge.